Multiple news reports of Health and Human Services Secretary Tom Price using private planes for extensive official travel have prompted several calls for probes by an inspector general and congressional overseers. 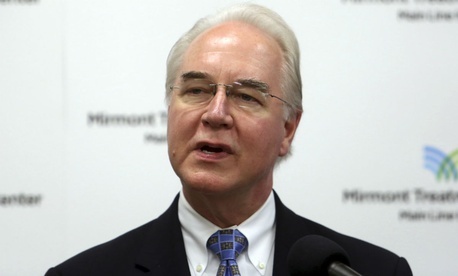 Politico on Thursday reported that Price took private charter flights at least 24 times in recent months at an estimated cost of $300,000, while working on such issues as hurricane response and Republican lawmakers’ bid to repeal Obamacare. On many of the routes, the reporters noted, less-expensive commercial flights were available. The Washington Post added the detail that one of the private aircraft contained “a cabin with high-backed leather chairs and a kitchen” and quoted a senior administration official saying that the White House did not approve Price’s travel on the chartered plane. Most past HHS secretaries have flown commercial. HHS has also been distributing a series of press releases highlighting Price’s travel to such places as Florida, where HHS emergency medical teams are deployed. Other Trump Cabinet members, many of them wealthy, have also been using private aircraft for official travel, but not generally at taxpayer expense, according to reporting by the Associated Press and Buzzfeed. Small Business Administration chief Linda McMahon confirmed that she has been using private aircraft, as has Education Secretary Betsy DeVos, who owns a plane. Treasury Secretary Steven Mnuchin caused a stir this summer when he requested an Air Force aircraft for what turned out to be a European honeymoon trip for himself and his new wife, citing “national security” requirements. Cummings also cited bipartisan hearings the oversight panel held in 2006 when similar travel issues at HHS arose during the George W. Bush administration. Separately on Wednesday, two other Democratic House members and three senators wrote to HHS inspector general Daniel Levinson asking for an investigation into whether Price’s charter flights violated federal regulations. "American taxpayers deserve assurance that their tax dollars are not wasted by the government's highest officials, and we are committed to holding Secretary Price to his stated pledges to reduce waste throughout the department," wrote Reps. Richard Neal, D-Mass., and Frank Pallone, D-N.J., in a letter co-signed by Sens. Patty Murray, D-Wash.; Ron Wyden, D-Ore.; and Gary Peters, D-Mich. They raised the broader criticism of whether Trump administration officials have abused the ethics waivers process. The HHS inspector general's office on Friday told Government Executive it is already looking into the matter, with a review focusing on whether Price's travel complied with Federal Travel Regulations but potentially encompassing other travel-related issues. "We take this matter very seriously, and when questions arose about potentially inappropriate travel, we immediately began assessing the issue," the IG office said in an email. "Work is underway and will be completed as soon as possible." On Thursday, the nonprofit Campaign Legal Center announced that it had submitted a Freedom of Information Act request for records on Price’s travel, citing five chartered flights from Sept. 13-15, estimated to have cost taxpayers $60,000. This story has been updated with comment from the HHS inspector general's office confirming that it is investigating whether Price's travel complied with regulations.